The Darke County Fair Board discussed ATV use, Junior Fair rules and distribution of fair magazines at its last monthly meeting before the 2018 Fair. GREENVILLE — The Darke County Agricultural Society held its last monthly meeting before the 2018 Fair Wednesday night. Vendor Kevin Flory raised concerns about the fair board’s policy on the use of all-terrain vehicles on the fairgrounds. Rules regarding ATV use have been discussed at several meetings over the past year. Under the previous rules, the vehicles could be used by vendors before 10 a.m. and after 11:30 p.m. in order to transport stock. A motion was made during a previous meeting to limit ATV use to fair-owned vehicles and those operated by emergency personnel, but the motion was defeated with some contractors saying the new rule would make it difficult for them to do business in a timely fashion. 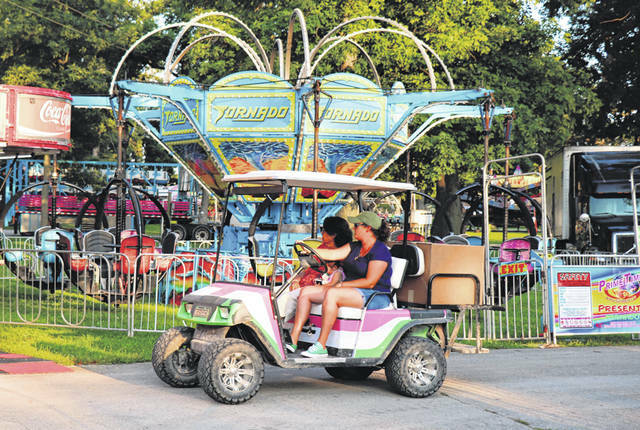 Concern about the use of larger vehicles on fair property stems from a series of incidents during last year’s fair in which patrons were injured after being struck by, or while attempting to board, the fair’s shuttles. It was ultimately decided that contractors would be allowed to use ATVs to carry out their duties on a case-by-case basis, as specified in each organization’s contract. Vendors, however, will be restricted to using golf carts during hours when the fairgrounds are open. “For some of us, a golf cart doesn’t work as well to transport our items,” Flory said. Flory also expressed concern that all vendors were being penalized because of the actions of a few who insist on breaking the rules. “Start policing things fairly and banning people who break the rules and you’ll be surprised how fast those problems clear up. It’ll spread like wildfire,” Flory said. The mother of a Junior Fair exhibitor requested that her daughter be allowed to bring a new animal to exhibit as a result of one of her previous animals being injured. This led to a lengthy debate with several Junior Fair Board members present insisting that the issue be left for the Junior Fair Board to resolve. Others countered by saying there was no time for this consideration so close to the fair. The board ultimately voted to allow the girl to bring another animal to exhibit. Finally, Early Bird publisher Keith Fouts requested permission for his publication’s fair magazine to be distributed by volunteers manning entry gates to the fairgrounds, alongside the official fair magazine published by The Daily Advocate. Advocate Advertising Manager Christine Randall objected, saying they had applied to have their magazine distributed several months earlier and questioning why the issue was being raised at such a late date. A motion by board member Cindy Riffle to allow The Early Bird’s magazine to be distributed was defeated by a vote of 7-4. Gates open at the Darke County Fairgrounds at 8 a.m. Friday. This entry was tagged ATV, Darke County Agricultural Society, Darke County Fair, Fair, fair board, Golf cart, Golf carts, Junior Fair, Junior Fair Board. Bookmark the permalink.